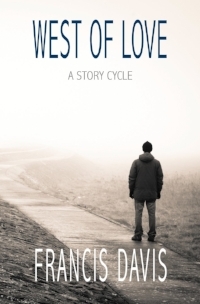 Saturday, November 18, at Shakespeare & Co.: Francis Davis reads from his collection of short stories, West of Love. Francis Davis was born and raised in Philadelphia, but has lived most of his adult life in the West. A finalist for the 2016 Katherine Anne Porter Prize in Short Fiction for West of Love, his debut collection of stories, he’s won writing fellowships from the Ragdale Foundation, The Millay Colony for the Arts, and the Vermont Studio Center. His stories have appeared in Story, Natural Bridge, and Weber: The Contemporary West, among other publications. A graduate of the University of Montana’s MFA program in fiction, Davis lives with his wife and three children in Dillon, Montana, where he’s an Assistant Professor of English at University of Montana Western. Staring down heartbreak and regret, Stewart Simmons flees a haunted Philadelphia for the beauty of the West. In a raw, yet lyrical, voice that gives life to the urgency and appetites of youth, West of Love presents a picture of the human heart—one that offers a testament to how we heal, how we go on. "West of Love is a fierce and moving elegy to young love in a world that's about to change, in essential ways, forever. The narrator of these linked stories tries to plumb his life and attachments in the '90s for clues to the man he is in middle age, and he does so in a pungent and obsessive voice that aches with yearning for the mysterious just-beyond. A memorable debut collection by a writer who knows how to get to the heart of it." --Deirdre McNamer, author of Red Rover. "Francis Davis has horses to spare, a thousand of them under a sleek hood, and when you get in the muscle car called West of Love, it will set a burn in you like none other! The stories in this fast, clean, engine of a book are powerful, all-American in their existential sweep, ironic undertow, and miraculous facility with the crucible called life. Get ready for torque, wonder, desolation, and transcendence. This one is on fire!" --Shann Ray, author of Balefire and winner of the American Book Award. "Rarely is the self-examination of a character's past rendered with such unabashed clarity as in these rich and heartfelt stories. In Stewart Simmons, the narrator of these linked stories, Davis has created a true to life character whose vulnerable willingness to speak honestly about the complexities of sexual identity, love and the interior workings of the human heart feels revelatory. The stories will stay with you, long after the book has been put down." --Daryl Farmer, author of Where We Land.